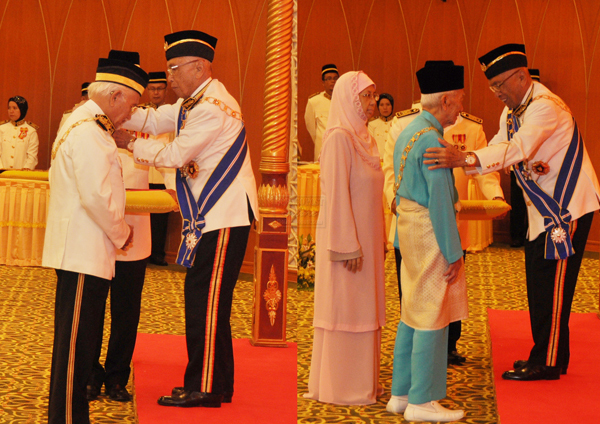 COMMEMORATIVE HONOUR: Taib (centre) presenting the ‘Pengasas Perjuangan Kemerdekaan’ (PPK) medal to Salahuddin. STATE AWARD: Salahuddin presenting the PPK medal to Taib (left) and Tun Abdul Rahman Ya’kub (right). HONOURED: Salahuddin presenting the PPK medal to (from left) Tajang, Dominic and Soon Kai. KUCHING: Head of State Tun Datuk Patinggi Abang Muhammad Salahuddin was bestowed the Golden Jubilee Commemorative Independence Medal award at an investiture ceremony held at the Astana Negeri, Petra Jaya, yesterday. 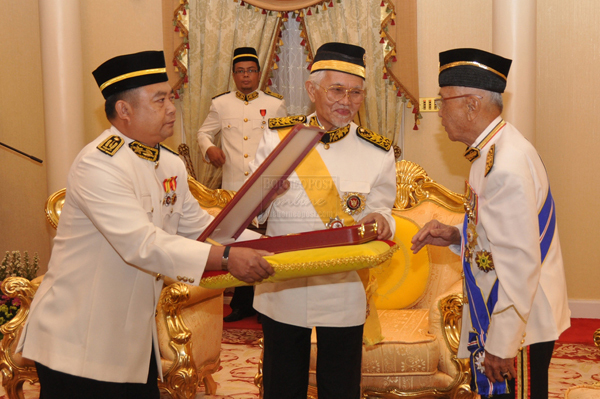 Chief Minister Pehin Sri Abdul Taib Mahmud presented Salahuddin with the award on behalf of the Sarawak government. The award carries the title ‘Pengasas Perjuangan Kemerdekaan’ (PPK). At a similar event held at the Lapau of the Dewan Undangan Negeri (DUN) later, Salahuddin bestowed the same award on five others. They are former Yang di-Pertua Negeri Tun Datuk Patinggi Abdul RahmanYa’kub, Pehin Sri Abdul Taib Mahmud, former state Minister Dato Sri Tajang Laing, former political secretary to the Chief Minister and former community leader Dato Sri Dominic Dago @ Dagokak Randan, and former Deputy Chief Minister Datuk Patinggi Tan Sri Dr Wong Soon Kai. The citation for Salahuddin was read by DUN Speaker Datuk Amar Mohd Asfia Awang Nasar, while that for Tun Rahman was read by Deputy Chief Minister Datuk Patinggi Tan Sri Alfred Jabu Numpang. The citation for Taib was read by Minister in the Chief Minister’s Office and Special Functions Minister Tan Sri Datuk Amar Adenan Satem, while Social Development Minister Tan Sri William Mawan Ikom read the citation for Tajang. Minister for Infrastructure Development and Communications Dato Sri Michael Manyin Jawong read the citation for Dominic and Local Government and Community Development Minister Dato Sri Wong Soon Koh read the citation for Soon Kai. Another recipient, Datuk Amar Dunstan Endawie Enchana was not present due to health problems. In a statement, State Secretary Tan Sri Datuk Amar Mohd Morshidi Abdul Ghani said the special medal award was given to them in recognition of their significant contributions to the development of the state’s economy, social and politic, civil service, education, medical, industries, sports, arts and culture and grassroots leaders. “The seven recipients are among those who have given invaluable contributions and played key roles, besides being directly involved in the struggle towards the formation of Sarawak independence within Malaysia on September 16, 1963,” he said. Apart from the PPK, the state government will also award three other categories of medals, namely Pingat Cemerlang Jubli Emas (PCE), Pingat Bakti Jubli Emas (PBE), and Pingat Terpuji Jubli Emas (PTE). Morshidi said 95 people would receive the PCE, 283 will receive the PBE medal, and 411 will be awarded the PTE medal. The medals will be given out in stages. Among those present were wife of the Head of State Toh Puan Datuk Patinggi Norkiah, Chief Minister’s wife Puan Sri Ragad Taib, Jabu’s wife Dato Sri Empiang Jabu, ministers and assistant ministers and their wives, family members of the recipients, government departments heads and other dignitaries.